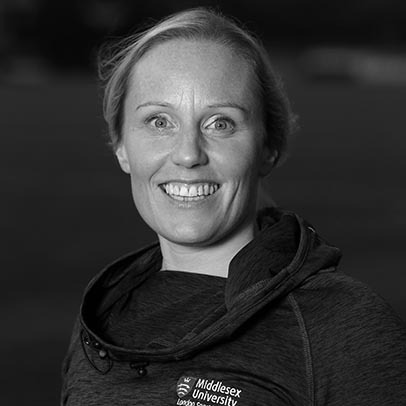 Kate is a Senior Lecturer in Sport and Exercise Science and Middlesex University and the LSI lead for teaching and learning. She teaches anatomy, physiology and research methods at Undergraduate level and is a University and Advance HE Teaching Fellow. Kate is a qualified personal trainer, assessor and ISAK anthropometrist and External examiner for Leeds Trinity University. Kate undertakes research in physical activity in children and adults and currently has three funded projects with Sport England, Oasis Schools and Tottenham Hotspur Foundation alongside Dr Lizi Smith. Her Professional Doctorate was awarded in 2016 exploring mobile technologies and gameplay in HE. Kate is also a Validation Chair and University rep, an active Teaching Fellow and external reviewer for University West of England and External Examiner for Leeds Trinity University. Level 3 Personal Trainer, Level 4 Postgraduate Diploma Sports and Remedial Massage Therapy, ISAK level 1 technician, A1 Assessor award, EIS Communicating with Athletes, Performance and Lifestyle Mentoring, 100% ME. Level 4 Silver SMA member & Level 5tutor, ISRM Full member, ISAK, REPs Level 3. Kate teaches Undergraduate physiology, Research Methods and anatomy as well as supervising dissertations. Kate is the department lead for Teaching and Learning and is involved in a number of related working groups. Her pedagogical research looks at technology and smartphone enhanced learning, engagement measures and peer observation. Engagement measurement in large and small group teaching sessions. A novel apporach to peer observation, a case study. Health Check data from a community project in Haringey. Physical activity strategies i na range of community projects in north london. Nevill, A. M., Bryant, E., Wilkinson, K., Gomes, T. N., Chaves, R., Pereira, S., ... & Duncan, M. J. (2018). Can waist circumference provide a new “third” dimension to BMI when predicting percentage body fat in children? Insights using allometric modelling. Pediatric obesity, e12491. Wilkinson, K. (2018) Mobile learning games before anatomy class - can they make up for lack of pre-session preparation? HEA Annual Conference 2018. Birmingham. Keane, L. G. and Wilkinson, K. (2016). Comparing AquaStretch with supervised land based stretching for Chronic Lower Back Pain. Journal of Bodywork and Movement Therapies. Wilkinson, K. and Barter, P (2016) DO MOBILE LEARNING DEVICES ENHANCE LEARNING IN HIGHER EDUCATION ANATOMY CLASSROOMS? Journal Pedagogical Development. Wilkinson, K. and Barter, P. (2015) DO MOBILE LEARNING DEVICES ENHANCE LEARNING IN HIGHER EDUCATION ANATOMY CLASSROOMS? 11th International Conference on Mobile Learning 2015, MADEIRA, PORTUGAL.